We maintain a huge inventory of bolts, from standard machine bolts and heavy hex bolts to more specialized varieties like elevator bolts and tension control bolts. We carry standard and metric, course and fine thread, the strongest off-the-shelf fastening available including a variety of finishes, from plain to hot dip galvanized. We offer over a large inventory of bolt products with various grip lengths, thread sizes and finishes. The material hardness and thread designs of our bolts provide the high strength and resistance to bolt threads stripping your need for demanding applications. Many of our bolts have a Zinc Flake finish that provides improved corrosion resistance compared to a bolt with Zinc Plate coating. A Stainless Steel Bolt is perfect for preventing corrosion and rust. Great for Boat or Utility Trailer! With nearly 3,000 different types of hex bolts in stock, we’re sure to have the right option for your needs. We carry a wide range of sizes, lengths, and grades. Carriage bolts are ideal for fastening wood and similar materials, and are specially designed to prevent unwanted turning after installation. We have the right size and length for any application. Manufactured from low carbon steel, heavy hex bolts are the “heavy duty” cousins of standard hex bolts. Heavy hex bolts are useful for applications that require extreme strength and durability. Available in rounded or square configurations, U-bolts are commonly used to mount or suspend pipes, struts, and similar components in building and construction applications. Commonly used on heavy equipment like road graders and plows (hence the name), plow bolts are extremely durable and impact and wear resistant. Available with flat, dome, or round heads. Elevator bolts are specially designed to provide a large weight-bearing surface and to prevent unwanted turning after installation. Commonly used on conveyor belts in grain elevators and similar applications. We stock eye bolts in sizes ranging from small to very, very large. Ideal for attaching ropes or cables for lifting or tying down objects. Designed for critical frame-construction applications, tension control bolts require special wrenches to achieve the proper torque. Denali Industrial Supply offers tension control bolts and the wrenches to go with them. 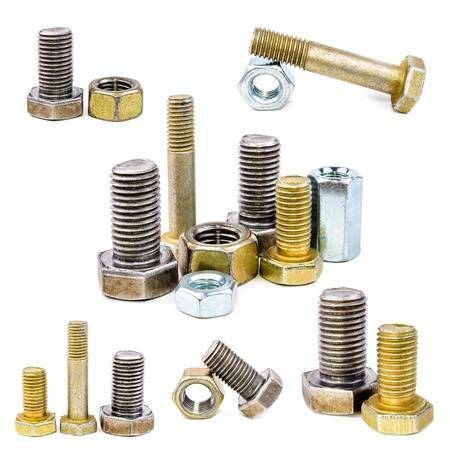 Our selection of miscellaneous bolts includes hanger bolts, step bolts, Huck power bolts, and more. If you don’t see the bolts you’re looking for listed elsewhere on our site, look here!